Experiment collection books can be lifesavers for parents and educators. 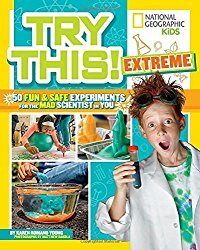 Try This Extreme: 50 Fun & Safe Experiments for the Mad Scientist in You by Karen Romano Young and photographs by Matthew Rakola is a new collection that will be sure to excite young scientists. What is extreme about this book? It explores extreme temperatures (for example, the effect of cold on glow sticks), extreme environments (test survival skills) , and extreme animal abilities (for example, exploring the insulating power of whale blubber). It is also extremely engaging. As we’ve come to expect from National Geographic Kids, the book is illustrated with fantastic color photographs. What makes it stand out is that it features real kids performing the experiments, and includes some of their comments, plus readers gets to meet all the kid scientists on pages 10 and 11. Seeing their peers doing the experiments draws kids in and empowers them to try some themselves. In fact, you will want to try out this 2018 AAAS Subaru Children’s Science Book Prize Finalist today! For a full review plus a hands-on experiment suggestion, visit Growing with Science blog. Categories: STEM Friday round-up | Tags: Try This Extreme: 50 Fun & Safe Experiments for the Mad Scientist in You | Permalink. Booktalk: Each page in this search-and-find book features a densely detailed landscape: rainforest, savannah, coral reef, and more. Within these landscapes are hiding threatened species such as the Adelie penguin, elephant, panda, and snow leopard. 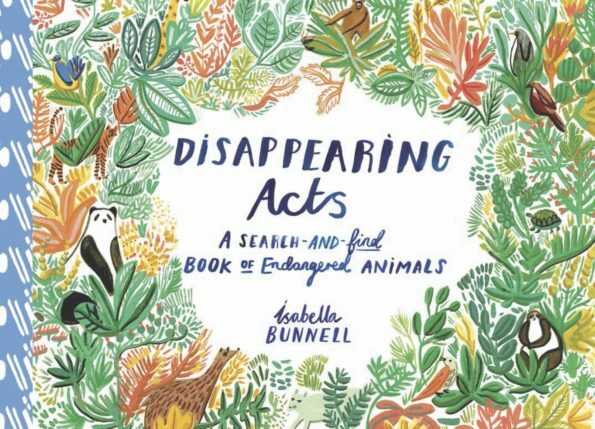 At the back of the book are descriptions of the animals, their numbers, their habitats, and why they are endangered. Maria Merian was born in the mid-1600s into a family of printers and engravers. As a girl, she watched her father and apprentices carve maps and illustrations onto copper plates which were inked and then pressed onto paper. She learned to mix pigments and make brushes. And she fell in love with insects – especially caterpillars. In Miriam’s time the silkworm was the only insect whose metamorphosis was well understood. But people still thought of it as “magical”. So Maria began studying caterpillars, keeping them in boxes and jars, sketching and making notes as they developed. She also wanted to know more about the connection between caterpillars and their food plants. And she did all this at a time when women were not allowed to study science. Indeed, many were burned as witches for conducting similar kinds of studies. What I like love about this book: It’s about moths, butterflies, and caterpillars! 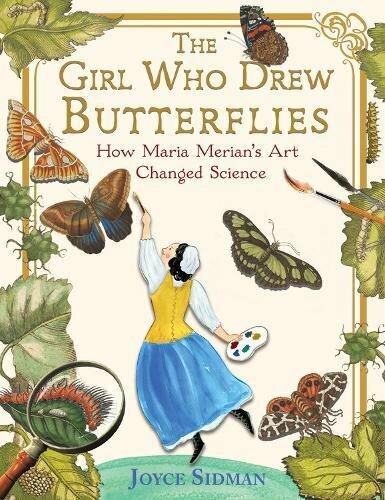 What I love is that Maria’s story is told in chapters that follow the life cycle of lepidoptera: egg, instars, molting, pupa, eclosing, expanding, flight… back to egg. Brilliant! I love how author Joyce Sidman shows the vital role women played as homemakers, business partners, yet they were never given the respect or power of the business role. She describes the realities of publishing books and painting in the 1600s, a time when wealthy men bought and read them. And she takes us with Maria on her adventures to South America to study insects. Head over to Archimedes Notebook for another bug book and some hands-on activities. 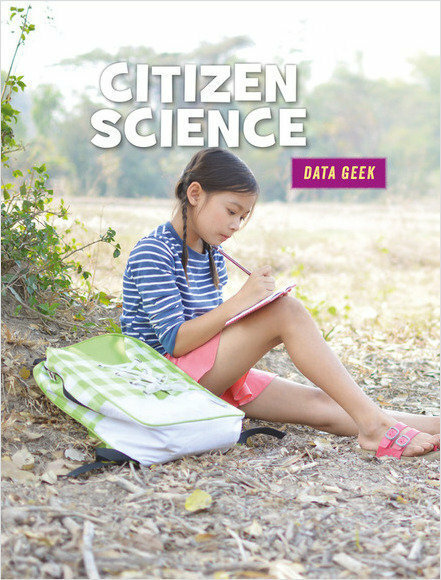 Booktalk: Anyone can play a role in helping scientists collect data about the natural world, including students! What’s the Buzz? New Books about Bees! Two books about bees were released earlier this month. Turn this Book into a Beehive! by Lynn Brunelle; illus. by Anna-Maria Jung (Workman Publishing) begins, Bees… whether you love ’em or hate ’em, we need bees for our survival. That may sound over-dramatic, but the truth is that bees are a keystone species. That means, writes author Lynn Brunelle, “plants and animals in an ecosystem depend on them for survival.” That dependence includes us – because one third of the food we eat depends on bees for pollination. Think: blueberries, apples, almonds, cucumbers. But there’s a problem. Bee populations are in decline. Not just honey bees, but the hard-working native pollinators that provide millions of dollars worth of free labor to fruit farmers. Bumble bees, carpenter bees, mason bees, leafcutter bees, digger bees…they are all too important to lose. 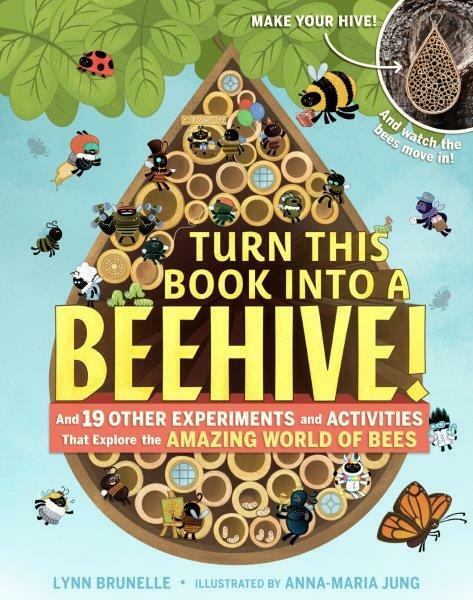 This book introduces us to bees, plants, and pollination. Then the author introduces us to two kinds of bees: mason bees and honey bees. There are 20 activities and experiments that provide children and families a safe way to learn about our busy, buzzy neighbors. And BEST of ALL – you can turn the book into a beehive for native bees. Durable cover and instructions included. 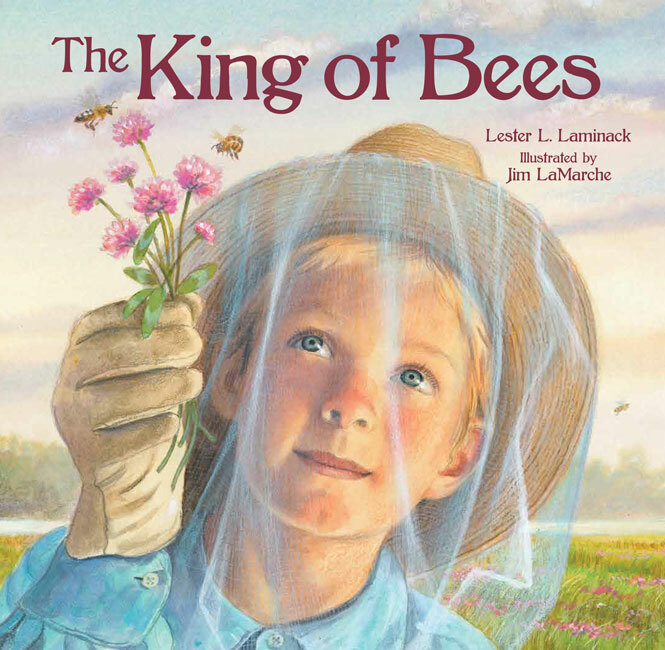 The King of Bees, by Lester L. Laminack; illus. by Jim LaMarche (Peachtree Publishers) opens: Henry and Aunt Lilla lived deep in the Lowcountry, where South Carolina reaches out and mingles with the saltwater for form tidal creeks and marshes. Don’t you just love that luscious language? Henry and his aunt live in a small house with a vegetable garden, a hen house, and beehives. He can’t wait until he is old enough to help care for the bees. Henry wants his own coveralls and bee hat. He also loves the bees, their humming, and the stories Aunt Lilla tells about how the sister bees work together. “Don’t they have any brother bees?” Henry asks. Then one day the bees begin to swarm and Henry decides he’ll help guide the bees to the new hive box Aunt Lilla is getting ready. Things don’t go as planned and he has a closer encounter with bees than he expected. 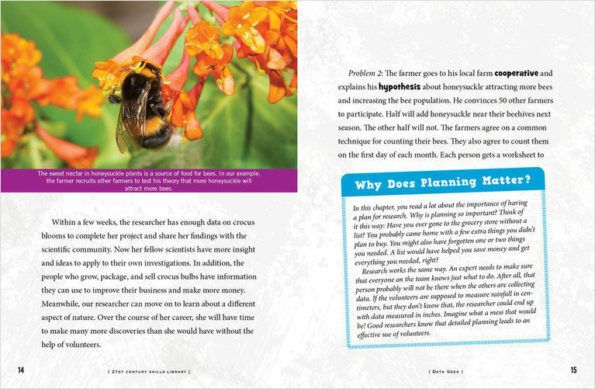 Head over to Archimedes Notebook for fun links and hands-on bee activities. Nature lovers are going to adore this new middle grade title, Woodpeckers: Drilling Holes and Bagging Bugs by Sneed B. Collard III. 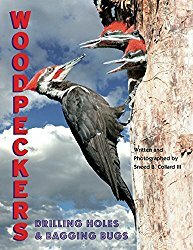 If you’ve never read a book by acclaimed science author Sneed B. Collard III, reading Woodpeckers will send you searching for more of his titles. First of all, he and his son (at fourteen years old!) traveled around North America and took the majority of the stunning color photographs in the book. That alone shows their knowledge about and passion for their subjects. Add the fun, conversational tone of the text, sprinkled with quotes from woodpecker experts and you have one amazing book! See more information and activity suggestions to accompany Woodpeckers at Growing With Science blog. Categories: STEM Friday round-up | Tags: Sneed B. Collard III, Woodpeckers | Permalink. 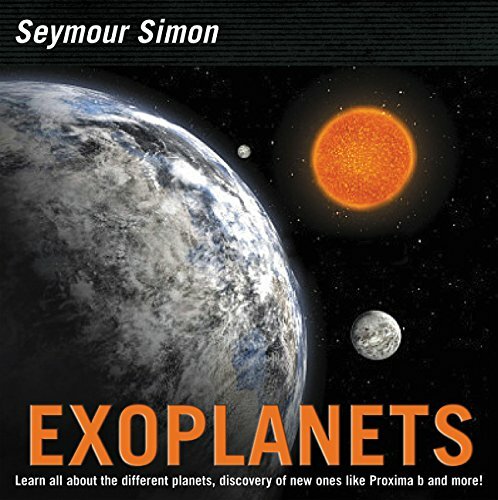 Booktalk: There are thousands of exoplanets scattered throughout the Milky Way galaxy, and scientists are on a constant quest to find one just like Earth. Examine the planets outside of our solar system and uncover what makes them habitable. Learn about our efforts to discover new life in the farthest reaches of space and explore the answer to the question: do aliens exist? Snippet: In recent years, a new and expanded search called Breakthrough Listen was begun by a famous physicist, Stephen Hawking. The Breakthrough search seeks to answer questions such as: Are we alone in the universe? Are there other Goldilocks planets in the Milky Way galaxy? Can we make the giant leap to go to the stars?